Giants of the Hoods is an interactive mobile guerrilla art influenced by street performance and urban VJ intervention. In the project, local residents will create visual characters present in their neighbourhood. Dance and video scratching will be primary tools used to animate the characters. 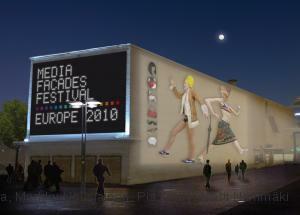 The animations will be created with Animata software developed by Kitchen Budapest. The Giants’ team will tour with participatory dance events in different neighbourhoods. Their vans, holding the Giant animations units projected on local facades, will contain a mobile VJ unit and a motion tracking system. At the end of the tour, a dance battle between neighbourhoods will be organised in a central city location. The Giants’ team consists of media and performing arts practitioners. Sini Haapalinna is a live artist whose work is based on exploring embodied experience of space, time, kinaesthetic and technology. Markku Nousiainen is a new media designer, artist and producer specialised in collaboration with dance and live artists. Dancer and choreographer, Pia Lindy works through participation and improvisation in different collaborations, environments & contexts. Matti Niinimäki is a DJ/visualist/media artist who also develops creative software for media arts.